This page is provided as a service to my students to aid in fabric selection before class. Q: What type of fabrics should I collect for this class? 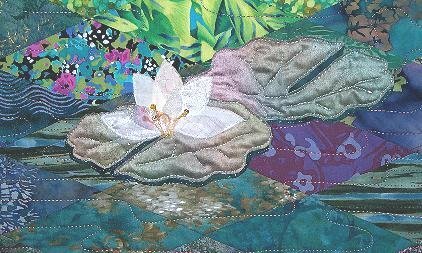 Garden Theme Fabric Suggestions: If you want to create a garden theme quilt, select fabrics printed with multiple colors, leaf and floral patterns. The fabrics above have a variety of colors and "visual textures" suitable to create a quilt with a garden theme. Vary the size and scale of the printed patterns for more interest and to create depth of field in your design. Ineffective Fabric Choices: Calico prints, rigid geometric designs, mini dots, precise (straight, geometric) stripes, or solid fabrics do not work well for this style of quilt. NOTE: You will be exchanging SIX pieces of fabric in class, and will receive fabrics from class mates to create a good collection to combine with your own special fabrics. The "donor" fabrics must be good-quality quilting cottons. I will preview donor fabrics in class if you are unsure of your fabric. PLEASE! 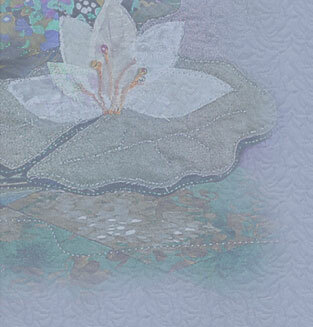 Purchase high-quality quilting cottons from a quilt store or online quilt fabric merchant. Although you may prefer to use lesser-quality cottons in your own quilt due to economic circumstances or availability factors, please donate ONLY high-quality fabrics for the exchange! TIP: Remember that you will be sewing a quilted masterpiece. Loosely-woven cottons sold at discount stores do not wear well. The colors frequently fade at a faster rate than quality fabrics. The finer the fabric quality, the more beautiful your quilt will remain through time, laundering and use. Q: What is the finished size of this quilt? How much fabric should I purchase? A: You will determine the finished sized based upon the intended use of the fabric portrait. If your goal is to make a bed-sized quilt, you will need LOTS of fabrics - perhaps 100-200 fat quarters (18" x 22"). If you are making a small wall-hanging compostion (painting-sized), you will need small quantities of 30-60 fabrics. Swapping fabrics in class will yield many of the extra prints you don't currently own. The size is easy to adjust - simply add more diamonds! Q: I have never shared fabric before; I feel uncomfortable with this part of the class. Will it be odd to share fabrics with strangers? A: Sharing fabrics is my favorite part of this class! I wouldn't want to try to make a beautiful quilt at home, with only my fabric stash to select from! Unless you have a vast fabric stash, it is a terrific method to acquire and share small quantities of a wide variety of print styles. The quilt designs are richer and more interesting with a depth of pattern and texture due to the combination of fabrics. You will love the energy generated in class as students begin to share fabrics, create their designs, and get to know each other. Fabric is a great conversation starter! Click here to see Monet paintings for inspiration.